Hi all you Goldbergites.This page will be updated every Saturday.Please go to my pic, poll, and trivia sites. Check it out every week for new additions.PLEASE sign my guestbook! 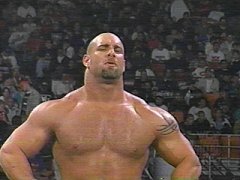 GOLDBERG is DA MAN. Every week he continues to tear through his contenders using the jackhammer.Goldberg is now 161-0. He will easily take on the winner of WW3. This site is owned by Aaron's Bill Goldberg productions. Want to join the Bill Goldberg (Annihilator) WebRing?